Continuing Srajan's 25-page report with impressions and photos collected by Marja & Henk. Already a year ago we had a really good time 'doing' the annual High End in Germany's third largest city Munich. A report on that event can be found here. The fun we had included seeing old friends, making new ones and enjoying the many rooms that did a great job of playing real music. We looked forward to a successful rerun and made early reservations. The PR machine of the event headed by the charming and very efficient Renate Paxa already at a very early stage confirmed that the sheer number of exhibitors would defy the negative media predictions about the economy. Instead, the amount of exhibitors was expected to actually surpass 2008 - all the more reason to contact our travel agent. For us, attending an audio show is not a sponsored affair. We do not get paid for our 6moons reviews or are at one point or another sponsored by a manufacturer. Our profile clarifies things further. Regarding this, it was a very pleasant surprise to hear our travel agency offer a treat. Lufthansa could take us from Amsterdam to Munich and back again for the stunning amount of €5 (five euro!) excluding taxes. If for any reason we had to cancel the trip, we would lose a tenner and get the airport and other taxes refunded. Not a bad deal at all. Book early and fly cheap seems to be a good mantra these days. When you travel on a regular basis, you know that border passage can be a pain in the neck. Schiphol Airport offers frequent travelers the possibility to skip the passport control at our border and also in the US. In Holland the service is called Privium and via a government-backed alliance with a US equivalent, the same service is provided there as well. The service starts with having your credentials checked by the border control authority. In Holland that is the military police better known as the Marechausee. After an application is made, you are invited for the check which is the same entering or leaving the country. Your passport is checked for physical validity, then run through a computer system to insure you are not a wanted felon. Once passed, you are asked to sit at a desk for an iris check. This procedure is quick but contacts must be taken out. Privium provides lens fluids and tissues in case you don't have those on you. It might take a few attempts to get the best iris shot. This shot is the master. When all is settled, you get a chip card. When you next cross the 'border' at Schiphol Airport, you go to a special kiosk and present your Privium card to a slot. Once accepted by the system, you can proceed to the gate. Depending on how the gate is organized or if you are traveling within just the EU community, you are either directly checked for 'security' reasons or later just prior to boarding. The same procedure applies at various international US airports. The biggest benefits are lack of pre-control and security check queues. Of course this service comes at a price and is voluntary but it beats fingerprinting and mug-shooting every time you cross the US border. 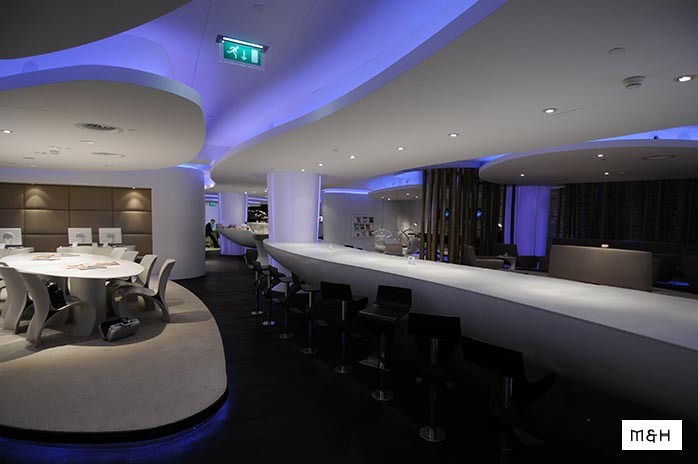 Another benefit is the new Privium Lounge at Amsterdam Schiphol airport. It is located ahead of the border control and hence always accessible as long as you have a valid Privium card. Even when you fly 'cattle' class as we did to Munich, you can enjoy the luxurious lounge with all its amenities. Once inside the lounge it seems like you stepped into the set of the Barbarella movie. Rounded shapes and plenty of blue light accents highlight a mostly white interior designed by the Dutch M+R interior architects bureau. 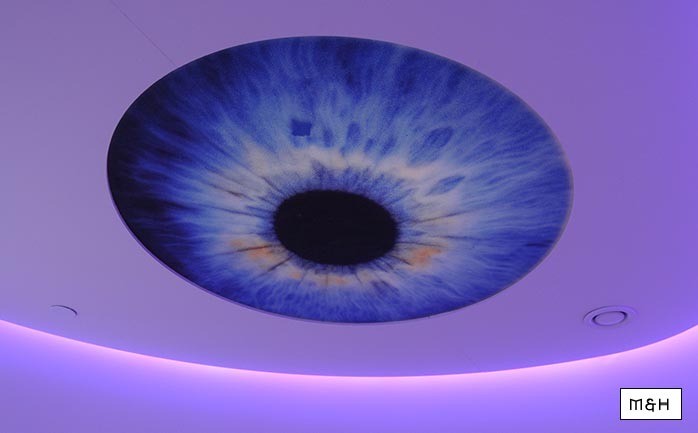 Our photos should convey a proper impression of the lounge with its décor where eye and iris become art objects. 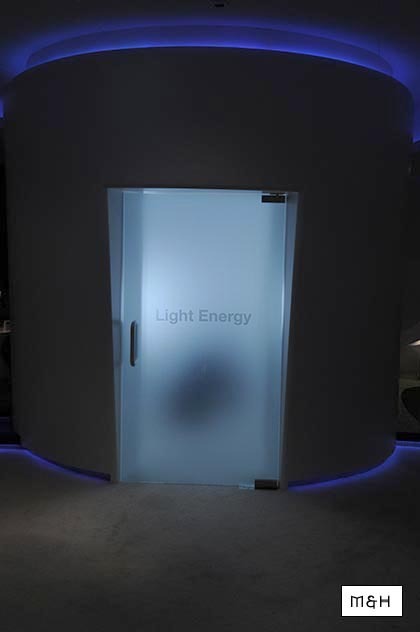 For those suffering from jet lag, a light therapy room can lower your melatonin levels and restore your circadian rhythms. When our flight came due, we nearly felt a bit sorry to trade the cocoon of the lounge for the hustle and bustle of a busy airport. Our renewed Privium passes gave us swift access to the area behind customs and the security check. Of course the metal detector beep went off and the shanks of Henk's boots proved the offenders. This time the security check included disposable plastic shoes to avoid traversing the security corridor on socks - yuck. Once cleared for the flight, boarding was quick and our €5 tickets got us into a Lufthansa Bombardier CRJ-200 not even half full. For this surprising price the friendly staff on board even offered a drink and sandwich and some 70 minutes later we arrived in sunny Munich. Next day was press day at the High End. A squeaky clean taxi got us fast and safe from our hotel in the city center to the M,O,C, Münchner Order Center complex which is built like the city's Franz Josef Strauss airport as a glass-clad steel-girder construction with plenty of light fall and see-throughs. On the downside, nice warm days as those of the show could increase the inside temperatures substantially. For our report, we won't proceed in room-by-room or any other form of order. For that one should refer to the substantial 384 page, mostly bilingual Messekatalog. We will instead single out certain rooms we thought worthy of extra attention for various reasons we'll explain. Press/trade (i.e. the first) day was busy with more attendants than last year. Was this a good sign depicting trust in the future's economy or a sort of desperation? Our first impression was the latter. Many people we spoke with during this first day conveyed a depressed and fatigued spirit. Setting up a temporary showroom is hard work no doubt. But to be already exhausted so early must have had other causes. Depending on who we spoke to, sales were either stable or substantially down. Only very few reports reached our ears of sales flying off the charts, with attendant plans to actually scale back production. But enough on the economy. Let's move over to another virtual entity based on emotion - music. During our initial stroll through Hall 3 of the M.O.C -- the European equivalent to the CES Zoo --we met with a man who is always present here, Peter Grundig of Greatech GmbH. Our initial encounter some years ago led to the review of his heart-warming μVAC amplifier. For 2009 Peter had two new items, first his Zound Port wireless digital amplifier. This amp has a range of 300 meters so it adds a new term to the amplifier world vocabulary. After frequency range, bandwidth, impedance, wpc etc., there's now reach. With its fast transition times, the amplifier is even suitable for A/V implementations where lip-synch performance is vital. With the amp as transmitter, a loudspeaker only needs to be equipped with a Zound Link receiver and loudspeaker cables become a thing of the dinosaur past. Consider the implications. Peter is all set to make new friends in our reviewers community. Another new Greatech item was a flat-panel speaker. 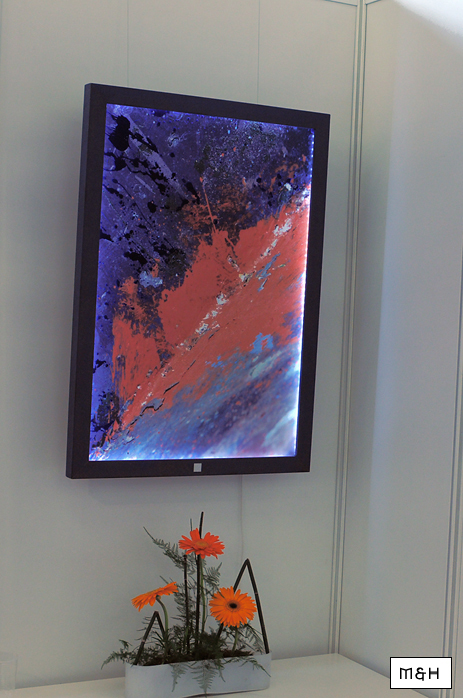 Based on NXT technology, the panel projects a diffuse sound pattern into the room. A subwoofer aids the lower frequencies. This itself was not really exciting yet but the fact that an artist used the panel as canvas for her work was. As an extra, the picture speaker had rows of LEDs embedded in its frame to add a special effect. Last year we reviewed another small amplifier we first met in Munich, the Yarland FV 34CIIISA imported by Dutch Crafty to Europe. 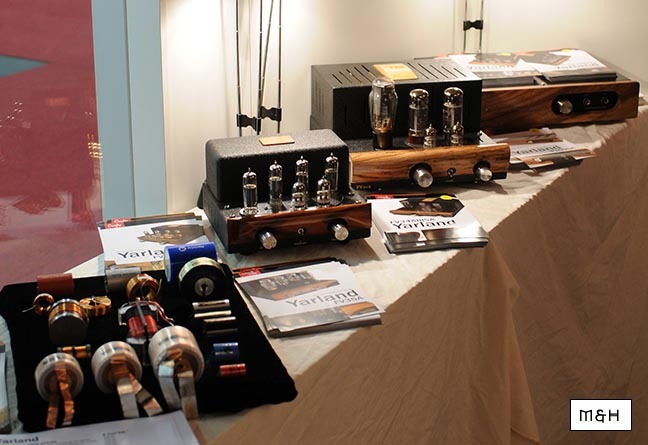 This year Crafty exhibited again and we could shake hands on another review assignment, a more powerful but still very affordable Chinese Yarland tube amp in combination with Crafty's own Beluga single-driver wideband loudspeaker. Because Crafty also distributes a wide range of capacitors, we might get a chance to do our first-ever cap shootout! How so? Crafty's Roland Breteler has one Yarland amplifier designed with hot-swappable capacitors as easy and safe as tube rolling. This will be a fun assignment!